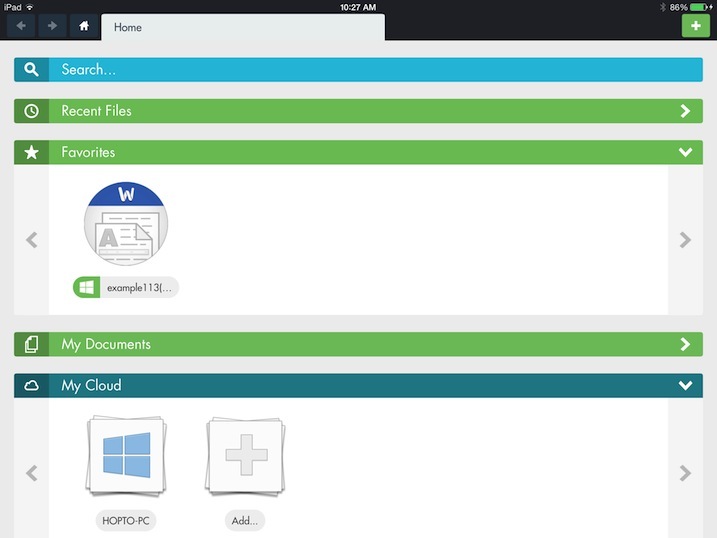 The hopTo app provides a mobile workspace where you can access and work on files on your iPad. It features a sleek and efficient touch interface that makes viewing, creating, and editing on your mobile device fast and easy. Access and work on your files whether they are stored on your own PC or on various cloud storage providers. Wherever an Internet connection is available, you can use hopTo and be more productive. What is Required in Order to Use hopTo? A hopTo user account – Click here to learn how to create an account. hopTo on your iPad – Click here to learn about getting hopTo on your iPad. An Internet connection on your iPad– WiFi or 3G/4G must be connected. hopTo on your Windows PC – (Optional: only required if you plan to access files stored on your PC). Click here to learn how install the hopTo File Connector on your PC. hopTo on your Mac OS – (Optional: only required if you plan to access files stored on your PC). Click here to learn how install the hopTo File Connector on your PC. Sign in – Launch hopTo on the iPad and enter the email address and password you chose when creating the hopTo account. Tutorial – When using hopTo for the first time, a short tutorial of three images will be presented with general guidelines on using the app. 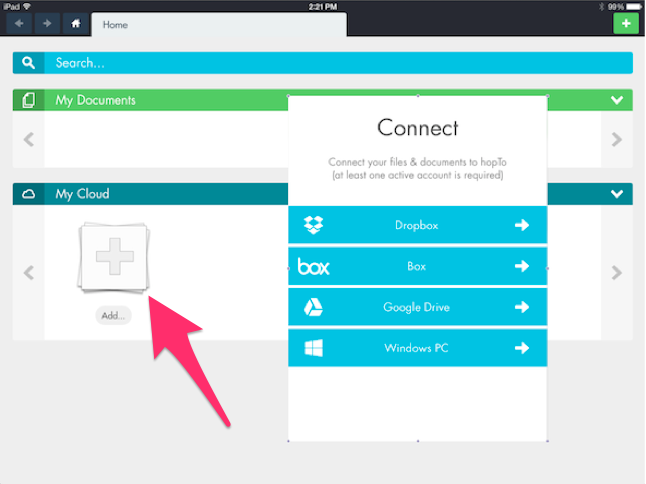 Connect to a file source – Tap the Add button and add file sources in My Cloud such as Dropbox, Box, Google Drive, OneDrive, Egnyte or your own Windows/Mac computer. You must have at least one file source in order run the app and access, create, and edit documents. What's on the Home Page? Search – Locate files on all the file sources connected to hopTo. Recent Files – Shows the 20 most recent files that were opened in hopTo. Favorites – Shows the files you have selected to be in Favorites. This panel is hidden until at least one file is selected as a Favorite, and you can have an unlimited number of Favorites. See “Basic File Operations” below to learn how to add/remove files. My Documents – Shows all the documents in the main user directories on connected file sources. My Cloud – Shows all connected file sources, and allows file sources to be added. The image below is an example Home page shown upon sign in and setup of a PC file source. With the exception of Search, the panels can be expanded or collapsed. Note that the Recent Files and Favorites panels are not shown since no files have been opened or added to the Favorites at this point. After opening files and adding them to Favorites, these panels become available in the Recent Files and Favorites panels. Note that they do appear in the image below, where the Recent Files and My Documents panels are collapsed. Search – Start typing in the Search box to get real-time results. When you see the file or folder you are searching for, tap to open. 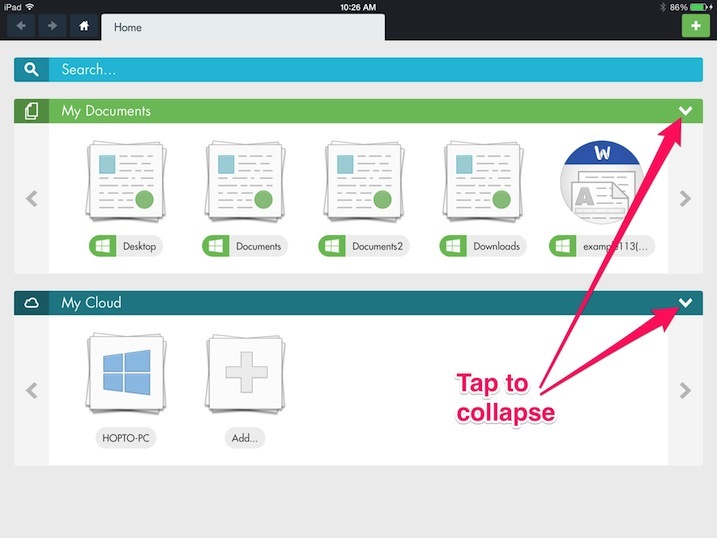 Browse – Tap on any of your file sources under My Cloud and browse the folders to find your files. The Add button is located on the top right corner of the app. 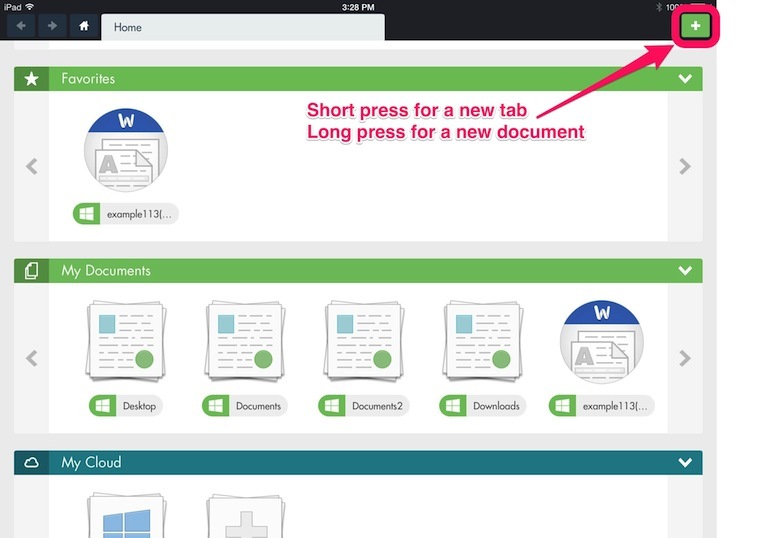 Short tap to open a new tab and long press to create a new Excel or Word file in the tab on any connected file source. Open in a new tab – Open the file in a new tab if available. A maximum of five tabs can be opened at once. Favorites – Add the file to the Favorites panel on the Home screen, where it will remain until you remove it. Share - Show a menu of compatible iOS apps that can be used to open, share, copy, print, or save the file depending on the file type.file. Email - Open your local configured email client to email the file directly from the iPad. Delete - Delete a file from the file source. If you delete from the Recent Files or Favorites panels the file is removed from those “shortcut” panels; you will be asked if you also want the file deleted from the file source. Save an image - Save the image to the Photos (Camera Roll) area on your iPad. Only appears for image files such as GIF, JPG, and PNG. Not sure what you mean by "Requesting for Simple Method to make use of Link" - would be great if you can provide some more details. Also - if you wish to suggest new ideas you can post them on our feature request form. Glad to be with hopto. Com ......Requesting for Simple Method to make use of Link..! Sorry to hear you had trouble locating this guide. I hope that now that you found that it will help you use the app.